Despite the apparent relationship between smoking and pneumothorax, 80–86% of young patients continue to smoke after their first episode of PSP.14 The risk of recurrence of PSP is as high as 54% within the first 4 years, with isolated risk factors including smoking, height and age >60 years.12 15 Risk factors for recurrence of SSP include age, pulmonary fibrosis and emphysema.15 16 Thus, efforts should be directed at smoking cessation after the development of a pneumothorax. The initial British Thoracic Society (BTS) guidelines for the treatment of pneumothoraces were published in 1993.17 Later studies suggested that compliance with these guidelines was improving but remained suboptimal at only 20–40% among non-respiratory and A&E staff. Clinical guidelines have been shown to improve clinical practice,18 19 compliance being related to the complexity of practical procedures20 and strengthened by the presence of an evidence base.21 The second version of the BTS guidelines was published in 200322 and reinforced the trend towards safer and less invasive management strategies, together with detailed advice on a range of associated issues and conditions. It included algorithms for the management of PSP and SSP but excluded the management of trauma. This guideline seeks to consolidate and update the pneumothorax guidelines in the light of subsequent research and using the SIGN methodology. Traumatic pneumothorax is not covered by this guideline. The typical symptoms of chest pain and dyspnoea may be relatively minor or even absent,23 so that a high index of initial diagnostic suspicion is required. Many patients (especially those with PSP) therefore present several days after the onset of symptoms.24 The longer this period of time, the greater is the risk of re-expansion pulmonary oedema (RPO).25 26 In general, the clinical symptoms associated with SSP are more severe than those associated with PSP, and most patients with SSP experience breathlessness that is out of proportion to the size of the pneumothorax.27 28 These clinical manifestations are therefore unreliable indicators of the size of the pneumothorax.29 30 When severe symptoms are accompanied by signs of cardiorespiratory distress, tension pneumothorax must be considered. The physical signs of a pneumothorax can be subtle but, characteristically, include reduced lung expansion, hyper-resonance and diminished breath sounds on the side of the pneumothorax. Added sounds such as ‘clicking’ can occasionally be audible at the cardiac apex.23 The presence of observable breathlessness has influenced subsequent management in previous guidelines.17 23 In association with these signs, cyanosis, sweating, severe tachypnoea, tachycardia and hypotension may indicate the presence of tension pneumothorax (see later section). Arterial blood gas measurements are frequently abnormal in patients with pneumothorax, with the arterial oxygen tension (Pao2) being <10.9 kPa in 75% of patients,31 but are not required if the oxygen saturations are adequate (>92%) on breathing room air. The hypoxaemia is greater in cases of SSP,31 the Pao2 being <7.5 kPa, together with a degree of carbon dioxide retention in 16% of cases in a large series.32 Pulmonary function tests are poor predictors of the presence or size of a pneumothorax7 and, in any case, tests of forced expiration are generally best avoided in this situation. The diagnosis of pneumothorax is usually confirmed by imaging techniques (see below) which may also yield information about the size of the pneumothorax, but clinical evaluation should probably be the main determinant of the management strategy as well as assisting the initial diagnosis. Standard erect PA chest x-ray. Supine and lateral decubitus x-rays. This has been the mainstay of clinical management of primary and secondary pneumothorax for many years, although it is acknowledged to have limitations such as the difficulty in accurately quantifying pneumothorax size. Major technological advances in the last decade have resulted in the advent of digital chest imaging, so that conventional chest films are no longer easily available in clinical practice in the UK or in many other modern healthcare systems. The diagnostic characteristic is displacement of the pleural line. In up to 50% of cases an air-fluid level is visible in the costophrenic angle, and this is occasionally the only apparent abnormality.33 The presence of bullous lung disease can lead to the erroneous diagnosis of pneumothorax, with unfortunate consequences for the patient. If uncertainty exists, then CT scanning is highly desirable (see below). These may provide additional information when a suspected pneumothorax is not confirmed by a PA chest film33 but, again, are no longer routinely used in everyday clinical practice. These imaging techniques have mostly been employed for trauma patients who cannot be safely moved. They are generally less sensitive than erect PA x-rays for the diagnosis of pneumothorax37 38 and have been superseded by ultrasound or CT imaging for patients who cannot assume the erect posture. Digital radiography (Picture-Archiving Communication Systems, PACS) has replaced conventional film-based chest radiography across most UK hospitals within the last 5 years, conferring considerable advantages such as magnification, measurement and contrast manipulation, ease of transmission, storage and reproduction. Relatively few studies have addressed the specific issue of pneumothorax and its diagnosis, and these have tended to focus on expert diagnosis (by consultant radiologists) and the more discriminating departmental (rather than ward-based) workstations. Even so, some difficulties were found in the diagnosis of pneumothorax in early studies.41 42 Since then there have been technological advances, such that digital imaging may now be as reliable as more conventional chest x-rays in pneumothorax diagnosis, but there have been no more recent studies to confirm this. Differences exist between the characteristics (screen size, pixel count, contrast and luminescence) and therefore the sensitivity of the more expensive departmental devices and the desktop and mobile consoles available in the ward environment. It is currently recommended that, where primary diagnostic decisions are made based on the chest x-ray, a diagnostic PACS workstation is available for image review. In addition, digital images do not directly lend themselves to measurement and size calculations; an auxiliary function and use of a cursor is required, but this is almost certainly more accurate than using a ruler and is easy to learn to do. Non-specialist clinicians and trainees may not always be familiar with these functions. This can be regarded as the ‘gold standard’ in the detection of small pneumothoraces and in size estimation.43 It is also useful in the presence of surgical emphysema and bullous lung disease44 and for identifying aberrant chest drain placement45 or additional lung pathology. However, practical constraints preclude its general use as the initial diagnostic modality. The size of pneumothoraces does not correlate well with the clinical manifestations.29 30 The clinical symptoms associated with secondary pneumothoraces are more severe in general than those associated with primary pneumothoraces, and may seem out of proportion to the size of the pneumothorax.27 28 The clinical evaluation is therefore probably more important than the size of the pneumothorax in determining the management strategy. Commonly, the plain PA chest x-ray has been used to quantify the size of the pneumothorax. However, it tends to underestimate the size because it is a two-dimensional image while the pleural cavity is a three-dimensional structure. The 2003 BTS guidelines22 advocated a more accurate means of size calculation than its predecessor in 1993,15 using the cube function of two simple measurements, and the fact that a 2 cm radiographic pneumothorax approximates to a 50% pneumothorax by volume. There are difficulties with this approach, including the fact that some pneumothoraces are localised (rather than uniform), so that measurement ratios cannot be applied. The shape of the lung cannot be assumed to remain constant during collapse.46 The measurement of the ratio of the lung to the hemithorax diameter is accurate and relatively easy with the new PACS systems by means of a cursor, once familiar with the PACS auxiliary functions. Primary pneumothorax occurs in patients with no evidence of other underlying lung disease. Although histological abnormalities are usually present, associated in particular with cigarette smoking, they have not been manifested by symptoms or loss of function. In contrast, secondary pneumothorax usually occurs in patients with overt underlying lung disease, most commonly chronic obstructive pulmonary disease (COPD). It is important to make this fundamental distinction as pneumothorax in COPD is much less well tolerated by the patient and tends to respond less favourably to management interventions and because the underlying lung disease requires appropriate treatment in addition. Several series have shown a reduced success rate for aspiration in patients aged >50 years as well as for chronic lung disease. It seems likely that these older patients had unrecognised underlying lung disease. This age criterion was included in the flowchart for SSP in the 2003 guidelines and is incorporated into the new flowchart (figure 2), serving as a prompt to consider the likelihood of SSP. Further criteria that are important in the decision-making process are the presence of significant breathlessness and the size of the pneumothorax. The rate of resolution/reabsorption of spontaneous pneumothoraces has been gauged as being between 1.25% and 2.2% of the volume of the hemithorax every 24 h,47 48 52 the higher and more recent estimate52 being derived from CT volumetry. Thus, a complete pneumothorax might be expected to take up to 6 weeks to resolve spontaneously and, conceivably, in the presence of a persistent air leak, even longer. 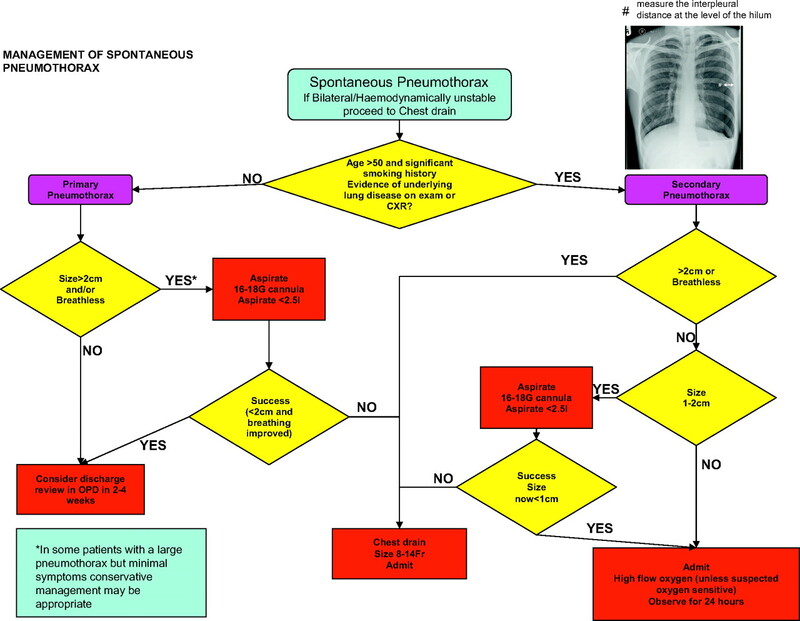 Flowchart of management of spontaneous pneumothorax. Both tension pneumothorax and bilateral pneumothorax are potentially life-threatening events that require chest drain insertion. Because such patients are generally excluded from trials of spontaneous pneumothorax, there is no evidence upon which to base recommendations, advice being based on the grounds of safe practice. Similarly, patients with associated large pleural effusions (hydropneumothorax) have also been excluded from trials, but are likely to require chest drain insertion and further investigation (see separate guideline). A summary of the management recommendations is shown in the flowchart (figure 2) with explanatory detail in the text below. Conservative management of small pneumothoraces has been shown to be safe,47 53 54 and patients who are not breathless can be managed as outpatients providing they can easily seek medical attention if any deterioration in their symptoms occurs. Up to 80% of pneumothoraces estimated as smaller than 15% have no persistent air leak, and recurrence in those managed with observation alone is less than in those treated by chest drains.55 Early review is advisable to ensure satisfactory resolution and to reinforce the advice on lifestyle. There is no evidence that active intervention improves the associated pain, which simply warrants appropriate analgesia. Needle aspiration or chest drain? Needle aspiration (NA) was recommended in the previous guidelines17 22 as the initial intervention for PSP on the basis of studies59 60 showing equivalent success to the insertion of large-bore chest drains, although this was not shown in another study.61 Seldinger (catheter over guide wire) chest drains have entered widespread usage since then and further studies have been published. A randomised controlled trial in a Kuwaiti population has confirmed equivalence between NA and chest drains (16 Fr), plus a reduction in hospital admission and length of stay for NA.62 A smaller study in India has also confirmed equivalence.63 Two recent case series have reported NA success rates of 69%64 and 50.5%.65 Several meta-analyses66–68 were limited by the small numbers of patients and studies69–77 but confirm equivalence, with NA success rates ranging from 30% to 80% (see evidence table available on the BTS website www.brit-thoracic.org.uk). If undertaken, NA should cease after 2.5 l of air has been aspirated, further re-expansion being unlikely59 because of the likely presence of a persistent air leak. The choice of initial intervention for PSP should take into account operator experience and patient choice; NA is less painful than chest drain insertion60 but failure in approximately one-third of patients will require a second procedure. Other national and consensus guidelines recommend either NA or small-bore chest drain insertion,97 or chest drain insertion alone.49 We believe that NA remains the procedure of first choice in most cases. Repeat NA is unlikely to be successful unless there were technical difficulties such as a blocked or kinked catheter. There is some limited evidence that VATS is the preferred ‘salvage’ strategy after failed NA,98 but this is not the usual practice currently in the UK where small-bore chest drain insertion is usually employed. Following successful NA, the patient can be considered for hospital discharge. A persistent air leak with or without incomplete re-expansion of the lung is the usual reason for consideration of the use of suction, although there is no evidence for its routine use.99–101 It is arbitrarily defined as the continued bubbling of air through a chest drain after 48 h in situ. A retrospective review of 142 cases of pneumothorax102 found a median time to resolution of 8 days which was not related to the initial size of pneumothorax, but longer for SSP. A persistent air leak was observed in 43 cases, 30 of which were treated with suction. The theory that underpins the role of suction is that air might be removed from the pleural cavity at a rate that exceeds the egress of air through the breach in the visceral pleura and to subsequently promote healing by apposition of the visceral and parietal pleural layers. It has been suggested that optimal suction should entail pressures of −10 to −20 cm H2O (compared with normal intrapleural pressures of between −3.4 and −8 cm H2O, according to the respiratory cycle), with the capacity to increase the air flow volume to 15–20 l/min.103 Other forms of suction are not recommended. High-pressure high-volume suction may lead to air stealing, hypoxaemia or the perpetuation of air leaks.104 Likewise, high-pressure low-volume systems should be avoided.105 High-volume low-pressure systems such as Vernon-Thompson pumps or wall suction with low pressure adaptors are therefore recommended. The addition of suction too early after chest drain insertion may precipitate RPO, especially in the case of a PSP that may have been present for more than a few days,106 and is thought to be due to the additional mechanical stress applied to capillaries that are already ‘leaky’.107 The clinical manifestations are cough, breathlessness and chest tightness after chest drain insertion. The incidence may be up to 14% (higher in younger patients with a large PSP), although no more than a radiological phenomenon in the majority of cases.106 Sometimes pulmonary oedema is evident in the contralateral lung.108 Fatalities have been reported in as many as 20% of 53 cases in one series,108 so caution should be exercised in this particular group of patients. Failure of a pneumothorax to re-expand or a persistent air leak should prompt early referral to a respiratory physician, preferably within the first 24 h. Such patients may require prolonged chest drainage with complex drain management (suction, chest drain repositioning) and liaison with thoracic surgeons. Drain management is also best delivered by nurses with specialist expertise. Surgical referral is discussed in a later section. This is a well-recognised complication of chest drainage.109 Generally it is of cosmetic importance only, although alarming for patients and their relatives, and subsides spontaneously after a few days. It is usually seen in the context of a malpositioned, kinked, blocked or clamped chest drain. It can also occur with an imbalance between a large air leak and a relatively small-bore chest drain. Occasionally, acute airway obstruction or thoracic compression may lead to respiratory compromise109 110 in which case tracheostomy, skin incision decompression and insertion of large-bore chest drains have all been used.109 For most, the treatment is conservative. All patients discharged after active treatment or otherwise should be given verbal and written advice to return to the Accident and Emergency department immediately should they develop further breathlessness. It is recommended that all patients should be followed up by a respiratory physician to ensure resolution of the pneumothorax, to institute optimal care of any underlying lung disease, to explain the risk of recurrence and the possible later need for surgical intervention and to reinforce lifestyle advice on issues such as smoking and air travel. Those managed by observation alone or by NA should be advised to return for a follow-up chest x-ray after 2–4 weeks to monitor resolution. Those with successful lung re-expansion before hospital discharge will also require early review because recurrence may occur relatively early. Since there is no evidence to link recurrence with physical exertion, the patient can be advised to return to work and to resume normal physical activities once all symptoms have resolved, although it is reasonable to advise that sports that involve extreme exertion and physical contact should be deferred until full resolution. Patients should be made aware of the danger of air travel in the presence of a current closed pneumothorax, and should be cautioned against commercial flights at high altitude until full resolution of the pneumothorax has been confirmed by a chest x-ray. While there is no evidence that air travel per se precipitates pneumothorax recurrence, the consequences of a recurrence during air travel may be serious. Many commercial airlines previously advised arbitrarily a 6-week interval between the pneumothorax event and air travel, but this has since been amended to a period of 1 week after full resolution. The BTS guidelines on air travel116 emphasise that the recurrence risk only significantly falls after a period of 1 year from the index pneumothorax so that, in the absence of a definitive surgical procedure, patients with SSP in particular may decide to minimise the risk by deferring air travel accordingly. After a pneumothorax, diving should be discouraged permanently117 unless a very secure definitive prevention strategy has been performed such as surgical pleurectomy. The BTS guidelines on respiratory aspects of fitness for diving118 deal with this in greater detail. Smoking influences the risk of recurrence,12 15 so cessation should be advised. Pregnancy is an issue to be discussed with younger female patients. Chemical pleurodesis has generally been advocated by respiratory physicians experienced in thoracoscopy. The instillation of substances into the pleural space should lead to an aseptic inflammation, with dense adhesions leading ultimately to pleural symphysis. There is a significant rate of recurrence of both primary and secondary pneumothoraces,12 and efforts to reduce recurrence by instilling various sclerosants—either via a chest drain, video-assisted thoracoscopic surgery (VATS) or open surgery—are often undertaken without clear guidelines to direct physicians in their use. In the vast majority of cases the prevention of recurrent pneumothoraces should be undertaken surgically using either an open or VATS approach, as the rate of recurrence following surgical pleurodesis via thoracotomy or VATS is far less than following simple medical pleurodesis with chemical agents,32 119 120 121 although direct comparative trials are lacking. A small number of patients are either too frail or are unwilling to undergo any surgical treatment and, in these situations, medical chemical pleurodesis may be appropriate. Chemical pleurodesis using graded talc is an effective alternative to tetracycline pleurodesis, but there are no controlled trials comparing the two in the treatment of pneumothorax. The issue of talc pleurodesis is discussed in the later section on surgical chemical pleurodesis as most trials using talc relate to its use in either thoracoscopic or open surgical techniques. Since we recognise chemical pleurodesis as an inferior option to surgical pleurodesis, we recommend that chemical pleurodesis should be undertaken by respiratory physicians or thoracic surgeons only. There is no evidence on which to base the ideal timing for thoracic surgical intervention in cases of persistent air leak. A cut-off point of 5 days has been widely advocated in the past55 but is arbitrary. Chee et al111 showed that 100% of primary pneumothoraces with a persistent air leak for >7 days and treated by tube drainage had resolved by 14 days. Also, 79% of those with secondary pneumothoraces and a persistent air leak had resolved by 14 days, with no mortality in either group. However, surgical intervention carries a low morbidity128 129 137–140 and post-surgical recurrence rates are low.128 129 Surgical intervention as early as 3 days has advocates,141 142 but there is no evidence that intervention before 5 days is necessary for PSP. Each case should be assessed individually on its own merit. Patients with pneumothoraces should be managed by a respiratory physician, and a thoracic surgical opinion will often form an early part of the management plan. Persistent air leak (despite 5–7 days of chest tube drainage) or failure of lung re-expansion. Surgical strategies: open thoracotomy or VATS? There are two main objectives in the surgical repair of persistent air leak from a pneumothorax and in the prevention of recurrence. The first objective is to resect any visible bullae or blebs on the visceral pleura and also to obliterate emphysema-like changes9 or pleural porosities under the surface of the visceral pleura.8 The second objective is to create a symphysis between the two opposing pleural surfaces as an additional means of preventing recurrence. In the past, surgeons have tended to favour a surgical pleurodesis with pleural abrasion while others have stressed the importance of various degrees of pleurectomy in recurrence prevention.137 153 154 Although there may be slight advantages of pleurectomy over pleural abrasion,137 a combination of the two is often used.155–158 Unfortunately there is a paucity of good comparative case-controlled studies in this area.128 129 In recent years, less invasive procedures using VATS have become more popular with lower morbidity although with slightly higher recurrence rates. The adult respiratory distress syndrome has been described following the use of talc. This probably relates to the size of the talc particles181 and is unlikely to occur with the use of graded talc.182 183 If talc is correctly sterilised, the incidence of empyema is very low.178 184 185 There does not appear to be a difference between talc poudrage and talc slurry pleurodesis. The advent of successful and well-tolerated VATS surgery will lead to less use of surgical chemical pleurodesis with talc. In those patients who are either unwilling or too unwell to undergo a VATS procedure, then medical pleurodesis with talc via a chest drain would be the preferred option. Lung disease, especially acute presentations of asthma and chronic obstructive pulmonary disease. Blocked, clamped or displaced chest drains. Patients receiving non-invasive ventilation (NIV). Miscellaneous group, for example patients undergoing hyperbaric oxygen treatment. A recent review188 has emphasised the important differences between the presentation in ventilated and non-ventilated patients, where it is typically seen after trauma or resuscitation. The former group is associated with a uniformly rapid presentation with hypotension, tachycardia, falling oxygen saturation and cardiac output, increased inflation pressures and cardiac arrest. This is frequently missed in the ICU setting37 and can also occur after nasal non-invasive ventilation (NIV). The latter group of awake patients show a greater variability of presentations which are generally progressive with slower decompensation. Tachypnoea, tachycardia and hypoxaemia lead eventually to respiratory arrest. Apart from these general physical signs, the most frequent lateralising sign found in a review of 18 case reports188 was that of decreased air entry (50–75%), with signs of tracheal deviation, hyperexpansion, hypomobility and hyperresonance present only in the minority. In neither group is imaging especially helpful; there is usually insufficient time to obtain a chest x-ray and, even if available, the size of the pneumothorax or the presence of mediastinal displacement correlate poorly with the presence of tension within a pneumothorax. However, a chest x-ray can, when time is available, confirm the presence of a pneumothorax (if uncertain) and the correct side. Although less common in women than in men, the occurrence of PSP in women of childbearing age is not unusual. There appears to be an increased risk of recurrence during pregnancy and during parturition,190 with potential risks to the mother and fetus. The earlier literature consists largely of case reports and described varied and relatively invasive management strategies such as prolonged intrapartum chest tube drainage, intrapartum thoracotomy, premature induction of labour or caesarean section. A more recent case series and literature review191 has recommended the use of more modern conservative management methods for which favourable outcomes have now been experienced. Pneumothorax that occurs during pregnancy can be managed by simple observation if the mother is not dyspnoeic, there is no fetal distress and the pneumothorax is small (<2 cm). Otherwise aspiration can be performed, chest drain insertion being reserved for those with a persistent air leak. Close cooperation between the respiratory physician, obstetrician and thoracic surgeon is essential. To avoid spontaneous delivery or caesarean section, both of which have been associated with an increased risk of recurrence, the safest approach will usually be that of elective assisted delivery (forceps or ventouse extraction) at or near term, with regional (epidural) anaesthesia. Less maternal effort is required with forceps delivery, which is therefore preferable. If caesarean section is unavoidable because of obstetric considerations, then a spinal anaesthetic is preferable to a general anaesthetic. Catamenial is a term that derives from the Greek meaning ‘monthly’. The typical combination of chest pain, dyspnoea and haemoptysis occurring within 72 h before or after menstruation in young women has been thought to be relatively rare. There are approximately 250 cases described in the medical literature,192 but it is likely that the majority of cases are not reported. Most of these references are of solitary case reports or small series. The associated pneumothorax is usually right-sided and there is a heightened tendency to recurrence coinciding with the menstrual cycle. Many cases have evidence of pelvic endometriosis. Although the aetiology is not fully understood, inspection of the pleural diaphragmatic surface at thoracoscopy often reveals defects (termed fenestrations) as well as small endometrial deposits. These deposits have also been seen on the visceral pleural surface. Among women undergoing routine surgical treatment for recurrent pneumothorax, however, catamenial pneumothorax has been diagnosed in as many as 25%.193 Thus, it may be relatively underdiagnosed. Extragenital or ‘ectopic’ endometriosis is an uncommon condition that can affect almost any organ system and tissue within the body, the thorax being the most frequent extrapelvic location. What has been termed the thoracic endometriosis syndrome (TES) includes catamenial pneumothorax, catamenial haemothorax, catamenial haemoptysis and lung nodules (purple or brown coloured). The most accepted theory to explain the phenomenon of catamenial pneumothorax is that of aspiration of air from the abdomen and genital tract via the diaphragmatic fenestrations, but the appearance of endometriosis deposits on the visceral pleural surface raises the possibility that erosion of the visceral pleura might be an alternative mechanism. Haemoptysis is thought to result from intrapulmonary endometriosis deposits, the mechanism by which endometrial tissue reaches the lung being poorly understood. The management strategies can be divided into thoracic surgical techniques and hormonal manipulation although, in the past, total abdominal hysterectomy and bilateral salpingohysterectomy have been employed. Thoracic surgical techniques have been varied and include diaphragmatic resection or plication of the fenestrations seen at thoracoscopy, the insertion of a mesh or patch over these fenestrations, electrocoagulation of the endometriosis deposits and pleurodesis. This variability reflects the general lack of success with surgical intervention alone, recurrence rates of up to 30% being documented.194 When combined with gonadotrophin-releasing hormone analogues amenorrhoea results, but recurrence has been avoided with follow-up approaching periods of 4 years.195 Successful patient management requires close cooperation between respiratory physicians, thoracic surgeons and gynaecologists. Due to the histopathology outlined above, pneumothoraces caused by PJP have a tendency to more prolonged air leaks, treatment failure, recurrence and higher hospital mortality.203 Up to 40% of these patients can develop bilateral pneumothorax. Treatment failures have been observed to correlate with the degree of immunosuppression, as reflected by CD4 counts.203 In view of these features, management strategies have been evolved that incorporate early and aggressive intervention including tube drainage, pleurodesis and surgical techniques such as pleurectomy.197 199 202–205 Observation and simple aspiration are not likely to suffice, even in the first instance. Over the last 5 years, and since the last BTS guidelines, the global spectrum of HIV infection has changed significantly as a result of the more widespread use of both antiretroviral therapy and PJP prophylaxis. While the disease burden remains very high in the underdeveloped world, the prognosis for such patients in Western societies has greatly improved,206 where this combination is now much less frequently encountered. As HIV is now becoming a more chronic disease associated with a high incidence of smoking and therefore of COPD, pneumothoraces might become more significant when they occur. However, the mortality of patients who require intensive care for PJP in HIV infection remains high, especially when pneumothorax occurs during ventilation. Although antiretroviral therapy that is commenced before or during hospitalisation can improve the outcome,207 the potential risk of the ‘immune reconstitution syndrome’ has to be taken into consideration. Even though long-term survival has improved significantly, spontaneous pneumothorax remains a common complication of cystic fibrosis, occurring in 0.64% of patients per annum and 3.4% of patients overall.208 It occurs more commonly in older patients and those with more advanced lung disease, and is associated with a poor prognosis, the median survival being 30 months.209 Contralateral pneumothoraces occur in up to 40% of patients.209 210 An increased morbidity also results, with increased hospitalisation and a measurable decline in lung function.208 While a small pneumothorax without symptoms can be observed or aspirated, larger pneumothoraces require a chest drain. The collapsed lung can be stiff and associated with sputum retention, thus requiring a longer time to re-expand. During this time other general measures, such as appropriate antibiotic treatment, are needed. Chest tube drainage alone has a recurrence rate of 50%, but interventions such as pleurectomy, pleural abrasion and pleurodesis have lower rates.211–213 With a success rate of 95% and with little associated reduction in pulmonary function, partial pleurectomy is generally regarded as the treatment of choice in patients with cystic fibrosis and recurrent pneumothoraces who are fit to undergo surgery.209 In those who are not fit for surgery and in whom re-expansion may take several weeks with a chest drain and suction, pleurodesis offers an alternative strategy.209 This had been thought to be a relative contraindication to later transplantation because of the need for a lengthier transplant procedure and excessive bleeding.214 A more recent study215 has concluded that previous pleural procedures should not be considered as a contraindication for transplantation, there being no significant effect on surgical outcome although more dense pleural adhesions were observed than in a control population. These pneumothorax guidelines differ from the last (2003) BTS guidelines in that they have been produced in accordance with the SIGN methodology and therefore have necessitated a careful analysis of the current underlying evidence. Unfortunately there are relatively few adequate studies that address the main areas of uncertainty, and few additions to the knowledge base in the last 7 years. Nevertheless, some subtle changes in practice have occurred. These are incorporated, together with coverage of some additional topics of relevance such as catamenial pneumothorax and the issue of pneumothorax in pregnancy. The treatment algorithm is now illustrated on a single flowchart for both PSP and SSP and places slightly less emphasis on the size of the pneumothorax and more on the clinical features. However, the trend towards more conservative management is maintained, with observation for many patients with PSP, aspiration for the remainder, and small-bore chest drains for persistent air leaks. The imaging of pneumothorax has undergone a major change due to the advent of PACS technology, and the implications of this are now described. Surgical practice has also developed with the widespread adoption of less invasive (VATS) procedures rather than open thoracotomies. While the challenge of pneumothorax management in patients with cystic fibrosis remains, there has been a significant reduction in pneumothorax in patients with HIV since the introduction of antiretroviral therapy and PJP prophylactic therapy, in the countries with advanced healthcare systems at least. It is hoped that these guidelines build upon their predecessors and lead to improved care for patients with pneumothorax, and that they inform and support the clinicians who care for them.
. Traité du diagnostic des maladies des poumons et du coeur. Tome Second, Paris: Brosson and Chaudé, 1819. (4).
. Spontaneous pneumothorax in the apparently healthy. Acta Med Scand (Suppl) 1932;43:1–159. (3).
. Incidence of spontaneous pneumothorax in Olmsted County, Minnesota: 1950–1974. Am Rev Respir Dis 1987;29:1379–82. (3).
. Epidemiology of pneumothorax in England. Thorax 2000;55:666–71. (3).
. Resection of pulmonary blebs and pleurodesis for spontaneous pneumothorax. Chest 1993;104:1767–9. (2−).
. Computed tomography in the aetiological assessment of idiopathic spontaneous pneumothorax. Chest 1990;98:341–7. (2+).
. Fluorescein-enhanced autofluorescence thoracoscopy in patients with primary spontaneous pneumothorax. Am J Respir Crit Care Med 2006;174:26–30. (3).
. Inflammation as a cause of spontaneous pneumothorax (SP) and emphysematous like changes (ELC)? Results of bronchoalveolar lavage (BAL). Eur Respir J 1995;8(Suppl 19):397. (2−).
. Smoking and the increased risk of contracting pneumothorax. Chest 1987;92:1009–12. (2++).
. Spontaneous pneumothorax. Am J Surg 1964;108:772–6. (3).
. Recurrence of primary pneumothorax. Thorax 1997;52:805–9. (3).
. Distribution of mechanical stress in the lung, a possible factor in localisation of pulmonary disease. Lancet 1971;1:839–41. (4).
. Onset of symptoms in spontaneous pneumothorax: correlations to physical activity. Eur J Respir Dis 1987;71:181–6. (3).
. The impact of spontaneous pneumothorax, and its treatment, on the smoking behaviour of young adult smokers. Respir Med 1998;92:1132–6. (2−).
. Independent risk factors for cumulative recurrence rate after first spontaneous pneumothorax. Eur Respir J 1991;4:324–31. (2+).
. Spontaneous pneumothorax in chronic obstructive pulmonary disease: complications, treatment and recurrences. Eur J Respir Dis 1987;71:365–71. (2+).
. Guidelines for the management of spontaneous pneumothorax. BMJ 1993;307:114–16. (4).
. Effect of clinical guidelines on medical practice: a systematic review of rigorous evaluation. Lancet 1993;342:1317–21. (3).
. Closing the gap between research and practice: an overview of systematic reviews of interventions to promote the implementation of research findings. BMJ 1998;317:465–8. (4).
. Evaluating the message: the relationship between compliance rate and the subject of a practice guideline. Med Care 1994;32:202–13. (2+).
. Potential benefits, limitations and harms of clinical guidelines. BMJ 1999;318:527–30. (4).
. BTS guidelines for the management of spontaneous pneumothorax. Thorax 2003;58(Suppl II):39–52. (4).
. Spontaneous pneumothorax. In: Light RW, Lee YCG, eds. Textbook of pleural diseases. 2nd edn. London: Arnold Press, 2008:445–63. (4).
. Spontaneous pneumothorax. Milit Med 1978;143:32–5. (3).
. Unilateral pulmonary edema in rabbits after re-expansion of collapsed lung. J Appl Physiol 1979;46:31–5. (3).
. Experimental pulmonary edema following re-expansion of pneumothorax. Am Rev Respir Dis 1973;108:664–6. (3).
. Changing clinical spectrum of spontaneous pneumothorax. Am J Surg 1992;164:528–31. (2+).
. Secondary spontaneous pneumothorax. Ann Thorac Surg 1993;55:372–6. (2−).
. Spontaneous pneumothorax. Dis Chest 1960;38:512–15. (3).
. The management of spontaneous pneumothorax. Chest 1970;57:65–8. (3).
. Respiratory gas exchange in patients with spontaneous pneumothorax. Thorax 1968;23:427–33. (2+).
. Intrapleural tetracycline for the prevention of recurrent spontaneous pneumothorax: results of a Department of Veterans Affairs Co-operative Study. JAMA 1990;264:2224–30. (1+).
. Pneumothorax:appearances on lateral chest radiographs. Radiology 1989;173:707–11. (3).
. Diagnosis of pneumothorax not improved by additional roentgen pictures of the thorax in the expiratory phase. Ned Tijdschr Geneeskd 1995;139:131–3. (2+).
. Expiratory chest radiographs do not improve visibility of small apical pneumothoraces by enhanced contrast. Eur Respir J 1996;9:406–9. (2+).
. Comparison of upright inspiratory and expiratory chest radiographs for detecting pneumothoraces. AJR 1996;166:313–16. (1+).
. Distribution of pneumothorax in the supine and semirecumbent critically ill adult. AJR 1985;144:901–5. (3).
. Pneumothorax:detection with upright versus decubitus radiography. Radiology 1993;186:19–26. (2+).
. Imaging of pleural disease. Imaging 2004;16:10–21. (4).
. Rapid detection of pneumothorax by ultrasonography in patients with multiple trauma. Crit Care 2006;10:R112. (2+).
. Detection of pneumothorax: comparison of digital and conventional chest imaging. AJR 1989;152:475–80. (2+).
. Efficacy of digital radiography for the detection of pneumothorax: comparison with conventional chest radiography. AJR 1992;158:509–14. (2+).
. Comparison between two methods for estimating pneumothorax size from chest x-rays. Respir Med 2006;100:1356–9. (2+).
. Role of CT in the management of pneumothorax in patients with complex cystic lung disease. Chest 1997;112:275–8. (3).
. CT diagnosis of malpositioned chest tubes. Br J Radiol 2000;73:786–90. (3).
. Chest radiograph—a poor method for determining the size of a pneumothorax. Chest 1993;103:26–9. (3).
. Conservative management of spontaneous pneumothorax. Lancet 1984;ii:687–8. (3).
. Spontaneous pneumothorax and its treatment. JAMA 1954;155:24–9. (3).
. Management of spontaneous pneumothorax. An American College of Chest Physicians Delphi Consensus statement. Chest 2001;119:590–602. (1−).
. Comparison of size classification of primary spontaneous pneumothorax by three international guidelines: a case for international consensus? Respir Med 2008;102:1830–2. (2+).
. How accurate is the light index for estimating pneumothorax size? Austral Radiol 2007;51:196–8. (2+).
. Estimating the rate of re-expansion of spontaneous pneumothorax by a formula derived from computed tomography volumetry studies. Emerg Med J 2006;23:780–2. (2+).
. Conservative management of spontaneous pneumothorax. Thorax 1966;21:145–9. (3).
. Spontaneous pneumothorax in Norfolk. Br J Dis Chest 1983;77:164–70. (3).
. Civilian spontaneous pneumothorax: treatment options and long term results. Chest 1989;96:1302–6. (3).
. Noninvasive treatment of pneumothorax with oxygen inhalation. Respiration 1983;44:147–52. (3).
. Oxygen therapy for spontaneous pneumothorax. BMJ 1971;4:86–8. (2−).
. Pneumothorax, chylothorax, hemothorax and fibrothorax. In: Murray J, Nadel J, Mason R, et al., eds. Textbook of respiratory diseases. 5th edn, Philadelphia: Saunders Elsevier, 2010:1764–91. (4).
. Manual aspiration versus chest tube drainage in first episodes of primary spontaneous pneumothorax. Am J Respir Crit Care Med 2002;165:1240–4. (1+).
. Simple aspiration versus intercostal tube drainage for spontaneous pneumothorax in patients with normal lungs. BMJ 1994;309:1338–9. (1−).
. Spontaneous pneumothorax: comparison of thoracic drainage vs immediate or delayed needle aspiration. Chest 1995;108:335–40. (1−).
. Aspiration versus tube drainage in primary spontaneous pneumothorax: a randomised study. Eur Respir J 2006;27:477–82. (1+).
. Role of simple needle aspiration in the management of spontaneous pneumothorax. J Assoc Phys Ind 2007;55:628–9. (1−).
. Needle aspiration as first-line management of primary spontaneous pneumothorax. Presse Med 2006;35:765–8. (3).
. Simple aspiration as initial treatment for primary spontaneous pneumothorax: results of 91 consecutive cases. J Emerg Med 2005;28:133–8. (3).
. Simple aspiration versus chest-tube insertion in the management of primary spontaneous pneumothorax: a systematic review (provisional record). Respir Med 2004;98:579–90. (1+).
. Management of emergency department patients with primary spontaneous pneumothorax: needle aspiration or tube thoracostomy? Ann Emerg Med 2008;51:91–100. (1+).
. Simple aspiration versus intercostal tube drainage for primary spontaneous pneumothorax in adults. Cochrane Database Syst Rev 2007;(1):CD 004479. (1+).
. Results of simple aspiration of pneumothoraces. Br J Dis Chest 1985;79:177–82. (3).
. Pneumothorax: treatment by small-lumen catheter aspiration. Aust NZ Med 1990;20:775–81. (3).
. Management of spontaneous pneumothorax with small lumen catheter manual aspiration. Chest 1982;81:693–4. (3).
. Spontaneous pneumothorax: marker gas technique for predicting outcome of manual aspiration. BMJ 1991;302:697. (3).
. Simple aspiration of pneumothorax. Singapore Med J 1994;35:50–2. (3).
. Simple aspiration of spontaneous pneumothorax. Br J Dis Chest 1981;75:207–8. (3).
. A place for aspiration in the treatment of spontaneous pneumothorax. Thorax 1985;40:66–7. (3).
. Catheter aspiration for simple pneumothorax. J Emerg Med 1986;4:437–42. (3).
. The role of simple aspiration in the management of primary spontaneous pneumothorax. J Emerg Med 2008;34:131–8. (3).
. British Thoracic Society guidelines for the management of spontaneous pneumothorax: do we comply with them and do they work? J Accid Emerg Med 1998;15:317–21. (3).
. Management of spontaneous pneumothorax—a Welsh survey. Postgrad Med J 2000;76:496–500. (3).
. Management of spontaneous pneumothorax: are British Thoracic Society guidelines being followed? Postgrad Med J 2002;87:80–4. (3).
. Spontaneous pneumothorax: use of aspiration and outcomes of management by respiratory and general physicians. Postgrad Med J 2003;79:345–7. (3).
. Management of spontaneous pneumothorax compared to British Thoracic Society (BTS) 2003 guidelines: a district general hospital audit. Prim Care Respir J 2007;16:291–8. (3).
. Treatment of pleural effusions and pneumothorax with catheters placed percutaneously under imaging guidance. AJR 1989;152:1189–91. (3).
. Treatment of pneumothoraces utilizing small calibre chest tubes. Chest 1988;94:55–7. (3).
. Small calibre catheter drainage for spontaneous pneumothorax. Am J Med Sci 1992;304:345–7. (3).
. Outpatient treatment of spontaneous pneumothorax in a community hospital using a Heimlich flutter valve: a case series. J Emerg Med 1997;15:115–19. (3).
. Management of pneumothorax with a mini-drain in ambulatory and hospitalized patients. Scand Cardiovasc J 2003;37:172–6. (3).
. Efficacy and complications of small-bore, wire-guided chest drains. Chest 2006;130:1857–63. (3).
. Pneumothorax treated by small-bore chest tube. Semin Intervent Radiol 2007;24:272–6. (3).
. Comparison of large- and small-bore intercostal catheters in the management of spontaneous pneumothorax. Int Med J 2003;33:495–9. (3).
. Treatment of malignant pleural effusion: pleurodesis using a small percutaneous catheter. A prospective randomized study. Respir Med 1998;92:593–6. (2+).
. Less pain with flexible fluted silicone chest drains than with conventional rigid chest tubes after cardiac surgery. J Thorac Cardiovasc Surg 2002;124:1027–8. (2+).
. Sequential treatment of a simple pneumothorax. Ann Emerg Med 1988;17:936–47. (3).
. Catheter aspiration for simple pneumothorax. Arch Surg 1989;124:833–6. (3).
. Role of small calibre chest tube drainage for iatrogenic pneumothorax. Thorax 1990;45:748–9. (3).
. Simplified stepwise management of primary spontaneous pneumothorax: a pilot study. Eur Respir J 2006;27:470–6. (3).
. Belgian Society of Pneumology. Guidelines on the management of spontaneous pneumothorax. Acta Chir Belg 2005;105:265–7. (1+).
. Salvage for unsuccessful aspiration of primary pneumothorax: thoracoscopic surgery or chest tube drainage? Ann Thorac Surg 2008;85:1908–13. (3).
. Catheter drainage of spontaneous pneumothorax: suction or no suction, early or late removal? Thorax 1982;37:46–8. (1−).
. Intercostal tube thoracostomy in pneumothorax: factors influencing re-expansion of lung. Ind J Chest Dis All Sci 1988;30:32–5. (1−).
. Preliminary report of a prospective, randomized trial of underwater seal for spontaneous and iatrogenic pneumothorax. J Am Coll Surg 2007;204:84–90. (3).
. Time course of resolution of persistent air leak in spontaneous pneumothorax. Respir Med 1995;89:129–32. (3).
. Persistent bronchopleural air-leak during mechanical ventilation: a review. Respir Care 1982;27:408–15. (4).
. Management of intercostal drains. Br J Hosp Med 1991;45:383–6. (4).
. Clinical evidence of re-expansion pulmonary edema. Chest 1991;100:1562–6. (3).
. Increased pulmonary vascular permeability as a cause of re-expansion edema in rabbits. Am Rev Respir Dis 1981;124:422–7. (3).
. Re-expansion pulmonary edema. Ann Thorac Surg 1988;45:340–5. (3).
. Subcutaneous and mediastinal emphysema. Pathophysiology, diagnosis and management. Arch Intern Med 1984;144:1447–53. (3).
. Acute ventilatory failure from massive subcutaneous emphysema. Chest 1993;104:978–80. (3).
. Persistent air-leak in spontaneous pneumothorax—clinical course and outcome. Respir Med 1998;92:757–61. (3).
. Timing of invasive procedures in therapy for primary and secondary spontaneous pneumothorax. Arch Surg 1991;126:764–6. (3). British Thoracic Society Emergency Oxygen Guideline Group. Guideline for emergency oxygen use in adult patients. Thorax 2008;63(Suppl V1):1–68. (4).
. Pigtail catheters vs large-bore chest tubes for the management of secondary spontaneous pneumothoraces in adults. Am J Emerg Med 2006;24:795–800. (2−).
. Delayed referral reduces the success of video-assisted thoracoscopic surgery for spontaneous pneumothorax. Respir Med 1998;92:246–9. (3). British Thoracic Society Standards of Care Committee. Managing passengers with respiratory disease planning air travel: British Thoracic Society recommendations. Thorax 2002;57:289–304. (4).
. Diving and chronic spontaneous pneumothorax. Chest 1985;87:264–5. (3). British Thoracic Society Fitness to Dive Group. BTS guidelines on respiratory aspects of fitness for diving. Thorax 2003;58:3–11. (4).
. Spontaneous pneumothorax: comparison of simple drainage, talc pleurodesis and tetracycline pleurodesis. Thorax 1989;44:627–30. (1+).
. Long term results after tetracycline pleurodesis in spontaneous pneumothorax. Ann Thorac Surg 1992;53:1015–17. (3).
. Minimally invasive management for first and recurrent pneumothorax. Ann Thorac Surg 1998;66:592–9. (4).
. Nd-Yag laser pleurodesis via thoracoscopy. Chest 1994;106:338–41. (3).
. Effectiveness of bleomycin in comparison to tetracycline as pleural sclerosing agents in rabbits. Chest 1993;104:1582–4. (2+).
. Chemical pleurodesis in primary spontaneous pneumothorax. J Thorac Cardiovasc Surg 1989;37:180–2. (1−).
. Spontaneous pneumothorax: long term results with tetracycline pleurodesis. Chest 1994;106:347–50. (2+).
. Comparison of the effectiveness of tetracycline and minocycline as pleural sclerosing agents in rabbits. Chest 1994;106:577–82. (2+).
. Histologic changes of doxycycline pleurodesis in rabbits. Chest 1994;106:1241–5. (2+).
. Recurrence rates of video-assisted thoracoscopic versus open surgery in the prevention of recurrent pneumothorax: a systematic review of randomised and non-randomised trials. Lancet 2007;370:329–35. (1++).
. Does video-assisted thoracoscopic pleurectomy result in better outcomes than open pleurectomy for primary spontaneous pneumothorax? Int Cardiovasc Thorac Surg 2008;7:673–7. (1++).
. Current aspects of spontaneous pneumothorax. Eur Respir J 1997;10:1372–9. (4).
. Long-term results after video-assisted thoracoscopic surgery for first-time and recurrent spontaneous pneumothorax. Ann Thorac Surg 2000;70:253–7. (3).
. Comparison of video-assisted thoracoscopic talcage for primary versus persistent secondary spontaneous pneumothorax. Eur Respir J 1997;10:412–16. (3).
. Videothorascopic talc poudrage in primary spontaneous pneumothorax: a single-institution experience in 861 cases. J Thorac Cardiovasc Surg 2006;131:322–8. (3).
. Intrapleural tetracycline for spontaneous pneumothorax with persistent air leak. Singapore Med J 1988;29:72–3. (3).
. Tetracycline pleurodesis during active pulmonary-pleural air leak for prevention of recurrent pneumothorax. Chest 1982;81:78–81. (1+).
. Optimum anaesthesia with intrapleural lidocaine during chemical pleurodesis with tetracycline. Chest 1993;3:533–6. (2−).
. Spontaneous and recurrent pneumothorax. Surgical review of 278 cases. Ann Chir 1992;46:165–9. (3).
. Surgical experience in the management of spontaneous pneumothorax, 1972–1982. Thorax 1983;38:737–43. (3).
. Surgical treatment of spontaneous pneumothorax by wedge resection without pleurodesis or pleurectomy. Eur J Cardiothorac Surg 1996;10:656–9. (3).
. Results of surgical treatment of persistent or recurrent pneumothorax. Ann Chir 1993;47:136–40. (3).
. The efficacy and timing of operative intervention for spontaneous pneumothorax. Ann Thorac Surg 1986;42:540–2. (2−).
. Surgery remains a late and under-utilised option in the management of spontaneous pneumothorax: should the British Thoracic Society guidelines be revisited? Thorax 1998;53(Suppl 4):A52. (3).
. Video-assisted thoracic surgery for spontaneous haemopneumothorax. Respirology 2007;12:443–7. (3).
. Video-assisted thoracic surgery for primary spontaneous haemopneumothorax. Eur J Cardio-Thorac Surg 2004;26:893–6. (3).
. Three years experience in video-assisted thoracic surgery (VATS) for spontaneous pneumothorax. J Thorac Cardiovasc Surg 1994;107:1410–15. (3).
. Survey of spontaneous pneumothorax in the Royal Air Force. Thorax 1967;22:462–5. (3).
. Surgical intervention in spontaneous pneumothorax. Respir Med 1992;86:1–2. (4).
. Is video-assisted thoracic surgery indicated in the first episode primary spontaneous pneumothorax? Int Cardiovasc Thorac Surg 2003;2:552–4. (3).
. The role of awake video-assisted thoracoscopic surgery in spontaneous pneumothorax. J Thorac Cardiovasc Surg 2007;133:786–90. (1+).
. Incidence of chronic pain after minimal-invasive surgery for spontaneous pneumothorax. Eur J Cardio-Thorac Surg 2001;19:355–8. (3).
. Incidence of chest wall paresthesia after video-assisted thoracic surgery for primary spontaneous pneumothorax. Eur J Cardio-Thorac Surg 2004;25:1054–8. (3).
. Effects of timing of thoracoscopic surgery for primary spontaneous pneumothorax on prognosis and costs. Am J Surg 2004;187:767–74. (3).
. Parietal pleurectomy for recurrent spontaneous pneumothorax. Surg Gynecol Obstet 1956;102:293–308. (3, 4).
. The management of spontaneous pneumothorax. J Thorac Cardiovasc Surg 1968;55:761–2. (4).
. Comparative study of thoracoscopy and thoracotomy in spontaneous pneumothorax. Lyon Chir 1994;90:193–6. (2−).
. Long term follow-up of different therapy procedures in spontaneous pneumothorax. J Cardiovasc Surg Torino 1994;35:229–33. (2−).
. Thoracoscopic management of primary spontaneous pneumothorax—a comparative study. Min Invas Ther Allied Technol 1996;5:69–74. (2−).
. Reoperations are common following VATS for spontaneous pneumothorax: study of risk factors. Interact Cardiovasc Thorac Surg 2006;5:602–7. (3).
. The surgical treatment of recurrent idiopathic spontaneous pneumothorax. J Thorac Surg 1941;10:566–70. (3).
. Transaxillary pleurectomy for treatment of spontaneous pneumothorax. Ann Thorac Surg 1980;30:567–74. (3).
. Transaxillary minithoracotomy: the optimal approach for certain pulmonary and mediastinal lesions. Ann Thorac Surg 1976;22:254–9. (3).
. Video-assisted thoracoscopic surgery versus thoracotomy for spontaneous pneumothorax. Ann Thorac Surg 1994;58:373–7. (1+).
. Video-assisted thoracoscopic surgery (VATS) in the management of spontaneous pneumothorax. Thorax 1997;52:307–8. (4).
. Safety and efficacy of video-assisted thoracic surgical techniques for the treatment of spontaneous pneumothorax. J Thorac Cardiovasc Surg 1995;109:1198–204. (3).
. Limited axillary thoracotomy vs video-assisted thoracoscopic surgery for spontaneous pneumothorax. Surg Endosc 1998;12:1155–8. (3).
. Comparison of the efficacy and safety of video-assisted thoracoscopic surgery with the open method for the treatment of primary spontaneous pneumothorax. Ann Thorac Med 2008;3:9–12. (2−).
. Video assisted thoracic surgery for treatment of pneumothorax and lung resections: systematic review of randomised clinical trials. BMJ 2004;329:1008–10. (1+).
. Video-assisted thoracoscopic surgery for primary spontaneous pneumothorax: evaluation of indications and long-term outcome compared with conservative treatment and open thoracotomy. Chest 2005;127:2226–30. (3).
. Axillary thoracotomy versus videothoracoscopy for the treatment of primary spontaneous pneumothorax. Ann Thorac Surg 2004;78:417–20. (1+).
. Cost analysis of video-assisted thoracic surgery versus thoracotomy: critical review. Eur Respir J 2003;22:735–8. (1++).
. Does a thoracoscopic approach for surgical treatment of spontaneous pneumothorax represent progress? Eur J CardioThorac Surg 1997;11:22–31. (3).
. Video-assisted thoracoscopic treatment of spontaneous pneumothorax: technique and results of one hundred cases. J Thorac Cardiovasc Surg 1996;112:385–91. (3).
. Immediate and long term results after surgical treatment of primary spontaneous pneumothorax by VATS. Ann Thorac Surg 1996;61:1641–5. (3).
. Reduced inflammatory response in minimally invasive surgery of pneumothorax. Arch Surg 1996;131:1079–82. (1−).
. Video-assisted thoracic surgery: primary therapy for spontaneous pneumothorax? Ann Thorac Surg 1995;60:931–5. (2−).
. Video-assisted thoracoscopic surgery does not deteriorate postoperative pulmonary gas exchange in spontaneous pneumothorax patients. Eur J Cardiothorac Surg 1999;16:48–53. (1+).
. Transaxillary minithoracotomy versus video-assisted thoracic surgery for spontaneous pneumothorax. Ann Thorac Surg 1996;61:1510–12. (1+).
. Talc pleurodesis for the treatment of pneumothorax and pleural effusion. Chest 1994;106:1215–22. (2).
. Treatment of complicated pneumothorax by simple talc pleurodesis under thoracoscopy and local anaesthesia. Thorax 1997;52:329–32. (3).
. An audit of medical thoracoscopy and talc poudrage for pneumothorax prevention in advanced COPD. Chest 2004;125:1315–20. (3).
. Adult respiratory distress syndrome following intrapleural instillation of talc. J Thorac Cardiovasc Surg 1983;85:523–6. (4).
. Randomized trials describing lung inflammation after pleurodesis with talc of varying particle size. Am J Respir Crit Care Med 2004;170:377–82. (1+).
. Safety of pleurodesis with talc poudrage in malignant pleural effusion: a prospective cohort study. Lancet 2007;369:1535–9. (2++).
. Pleurodesis using talc slurry. Chest 1994;106:342–6. (3).
. Comparison of bleomycin and talc for the control of pleural effusions secondary to carcinoma of the breast. Br J Surg 1989;76:1266–7. (1−).
. Tension pneumothorax. Intensive Care Med 1994;20:468–9. (4).
. Tension pneumothorax: diagnostic and therapeutic pitfalls. Crit Care Med 1993;21:177–9. (4).
. Tension pneumothorax—time for a re-think? Emerg Med J 2005;22:8–16. (4).
. Needle thoracostomy in trauma patients: what catheter length is adequate? Acad Emerg Med 2003;10:495. (3).
. Spontaneous pneumothorax complicating pregnancy: case report and review of the literature. J Emerg Med 1989;7:245–8. (3).
. Pneumothorax and pregnancy. Chest 2007;132:1044–8. (3).
. Catamenial pneumothorax revisited: clinical approach and systematic review of the literature. J Thorac Cardiovasc Surg 2004;128:502–8. (3).
. Catamenial pneumothorax: a prospective study. Chest 2003;124:1004–8. (3).
. Catamenial and noncatamenial, endometriosis-related or nonendometriosis-related pneumothorax referred for surgery. Am J Respir Crit Care Med 2007;176:1048–53. (3).
. Catamenial pneumothorax: surgical repair of the diaphragm and hormone treatment. Ann R Coll Surg 2006;88:547–9. (3).
. Pneumothorax in AIDS. Ann Intern Med 1991;114:455–9. (2+).
. Surgical management of pneumothorax in patients with acquired immune deficiency syndrome. Arch Surg 1991;126:1272–7. (3).
. Roentgenographic patterns of Pneumocystis carinii in 104 patients with AIDS. Chest 1987;91:323–7. (3).
. Pleural disease and acquired immune deficiency syndrome. Eur Respir J 1997;10:2638–43. (4).
. Pulmonary manifestations of AIDS: review of 106 episodes. Radiology 1986;161:87–93. (3).
. Evidence for destruction of lung tissue during Pneumocystis carinii infection. Arch Intern Med 1987;147:746–9. (3).
. AIDS-related spontaneous pneumothorax. Risk factors and treatment. Chest 1995;108:946–51. (2+).
. Treatment of AIDS-related spontaneous pneumothorax: a decade of experience. Chest 1994;106:693–6. (3).
. Pneumothorax in patients with AIDS. Respir Med 1993;87:43–7. (3).
. Pneumothorax in AIDS: case reviews and proposed clinical management. Genitourin Med 1996;72:258–60. (3).
. HIV as a chronic disease. Clin Med 2009;9:125–8. (4).
. Improved survival with highly active antiretroviral therapy in HIV-infected patients with severe Pneumocystis carinii pneumonia. AIDS 2003;17:73–80. (2+).
. Pneumothorax in cystic fibrosis. Chest 2005;128:720–8. (2++).
. Pneumothorax in cystic fibrosis: a 26-year experience. Ann Thorac Surg 1989;47:204–7. (3).
. Talc poudrage in the treatment of spontaneous pneumothoraces in patients with cystic fibrosis. Ann Surg 1986;204:677–80. (3).
. Diagnosis and treatment of cystic fibrosis: an update. Chest 1984;85:802–9. (4).
. Management of pneumothorax in cystic fibrosis. J Pediatr Surg 1983;18:492–7. (3).
. Management of pneumothorax in adults with cystic fibrosis. Thorax 1982;37:850–3. (3).
. Treatment of pneumothorax in cystic fibrosis in the era of lung transplantation. Chest 1992;101:1187–8. (4).
. Lung transplantation outcome in cystic fibrosis patients with previous pneumothorax. J Heart Lung Transplant 2005;24:865–9. (3).
. Iatrogenic pneumothorax: etiology and morbidity. Respiration 1992;59:215–20. (3).
. Significance of iatrogenic pneumothoraces. Chest 1994;105:1147–50. (3).
. Needle thoracocentesis in tension pneumothorax: insufficient cannula length and potential failure. Injury 1996;27:321–2. (3).
. Predicting risk of pneumothorax in needle biopsy of the lung. Chest 1984;85:232–5. (3).
. Accidental iatrogenic pneumothorax in hospitalized patients. Med Care 2006;44:182–6. (3).
. Efficacy of the lateral decubitus position in preventing pneumothorax after needle biopsy of the lung. South Med J 1988;81:1140–3. (2+).
. Risk of pneumothorax not increased by obstructive lung disease in percutaneous needle biopsy. Chest 1994;105:1705–8. (3).
. Pneumothorax in the intensive care unit: incidence, risk factors, and outcome. Anesthesiology 2006;104:5–13. (2++).
. Pneumothorax and pneumomediastinum during pediatric mechanical ventilation. Crit Care Med 1979;7:536–9. (3).